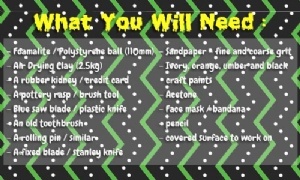 A foamalite (polystyrene) ball of your own preferred size. 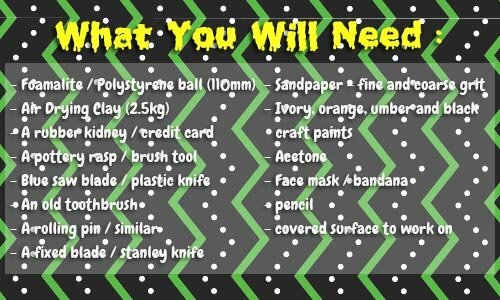 I used a ball roughly 110mm in diameter; Air drying clay - to cover plus build up (This tutorial calls for about 2.5kg); a bowl of water; a rubber kidney / credit card; a pottery rasp / brush type instrument; a blue saw blade/ serrated plastic knife; an old toothbrush; a rolling pin or some other such instrument; a sharp fixed blade knife / Stanley knife; sandpaper in a fine and rough grit; Ivory, Orange, Umber and Black craft paint; Acetone; Face mask / bandana and a pencil and a covered surface to work on. 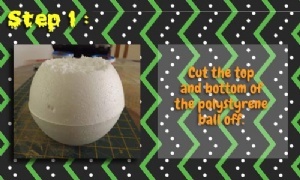 Cut the bottom and top of the foamalite ball off as shown. 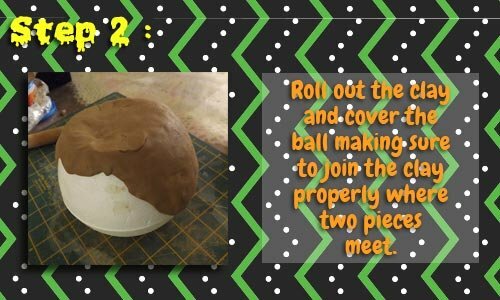 Roll out your air dry clay to roughly 1cm thickness and start covering your ball, ensuring that you join the clay well where two pieces meet/ overlap. 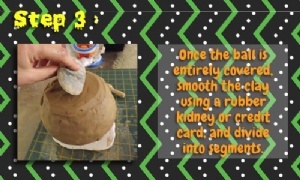 Smooth your clay out with a rubber kidney. If you do not own one, an old credit card should also do the trick. Then divide your pumpkin into its five segments by drawing light lines on it. 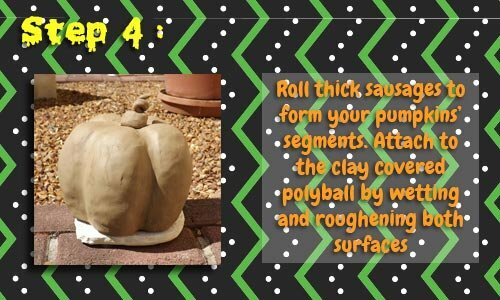 Roll out thick sausages of clay and start building up the body of your pumpkin. In the case of this tutorial: 5 segments / sausages. 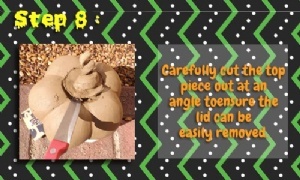 Do not just press the clay together, rather wet and "roughen" the surface lightly with an old toothbrush. Do this on both the clay already on the foamalite ball, as well as the sausages of clay you are going to stick to it. Then work the clay - making sure that you keep the centers of the segments the thickest and thinner where they join one another. 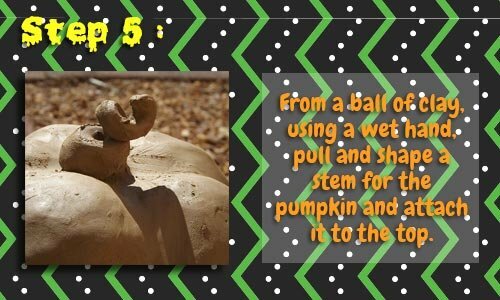 Making the pumpkins stem: Take a ball of air dry clay and grasp it in your fist so that there is a piece sticking out of the bottom of your clasped hand. 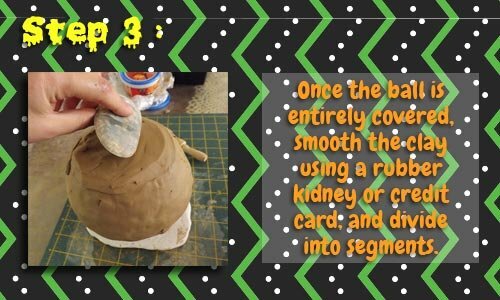 Wet your free hand thoroughly and start pulling down on the clay as if you are milkng a cow (this is the same motion as "pulling a handle" in pottery terms) to smooth and elongate the clay. Once you have a sufficient length gently nip it off the ball and twist into a twirl. 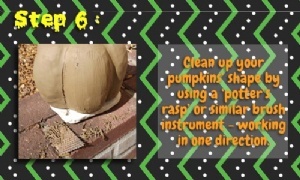 Attach it to your pumpkin to form its stem. 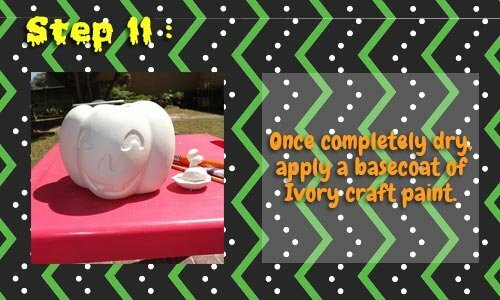 Leave your clay to stiffen up a bit so that it is halfway dried, not all the way. 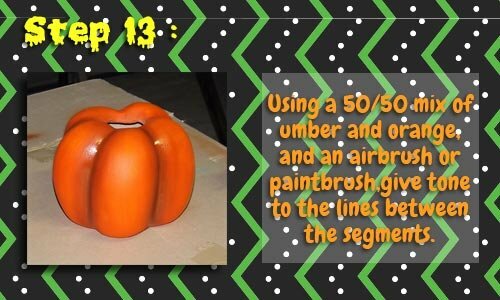 Now take your potters rasp / similar brush type instrument and start working off the excess clay - cleaning up the shape and working in one direction. 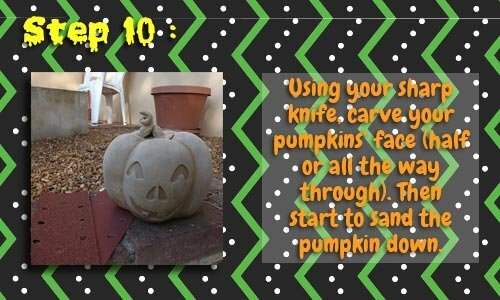 Next take your blue saw blade or a plastic serrated knife and smooth off even more clay and refining your pumpkins shape. 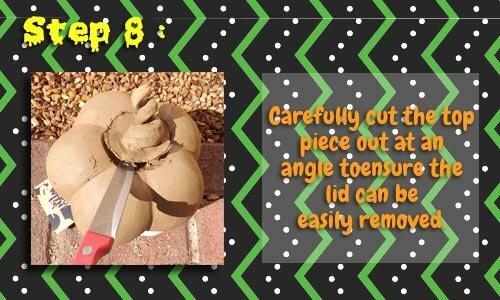 Cutting the hole at the top: cut in at an angle so as to ensure that the top can be used as a lid. 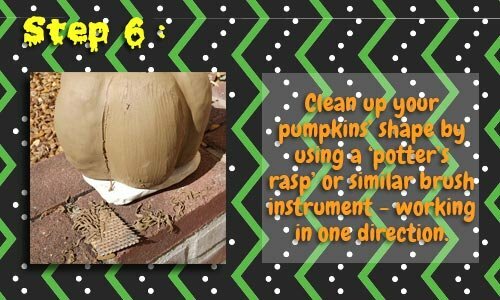 When you are happy with the hardness of your clay you can put your face mask/ bandana on and move outside / to a well ventilated area with your pumpkin. NOTE: Please take extra care to either work outside or in an extremely well ventilated area. Acetone has an extremely strong odour and can harm the lungs. 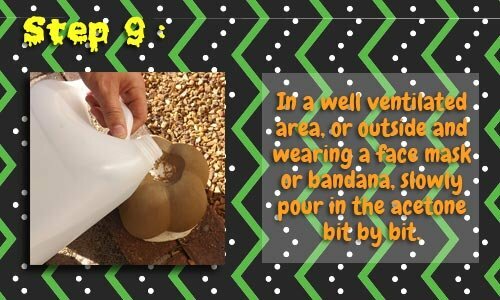 Please always wear your face mask when working with such chemicals. Now you will be pouring small amounts of acetone onto the polystyrene ball at a time inside of your clay pumpkin. 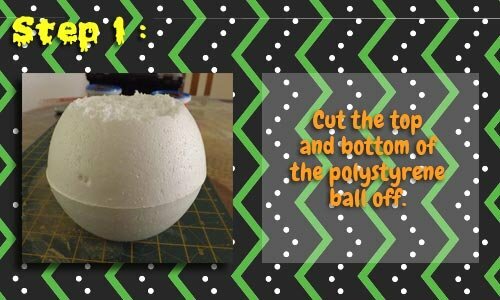 Start by pouring a small amount onto the poly ball. It will melt instantly and as you pour more in, the ball will become a slimy mess at the bottom of the pumpkin. Remove this with a spoon as quickly as possible. Carry on melting the polystyrene until all is removed. 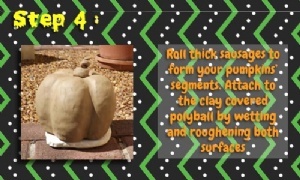 Once the poly ball is removed you can draw your pumpkins face on and carefully start carving it out. You can either carve halfway through (as in this tutorial) or right through. 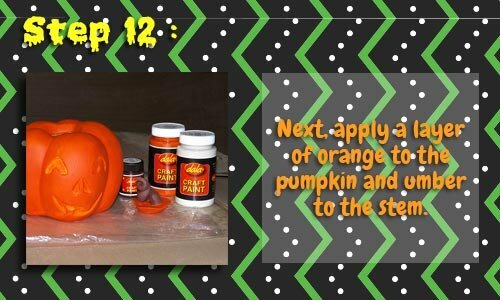 When you are happy with the carving you can start sanding down your pumpkin with the rough grit first, and then the finer grit sandpaper. Let your pumpkin dry completely and then start painting by using 'Ivory' first for the basecoat. Next paint the Orange base coat and brown on the stem. 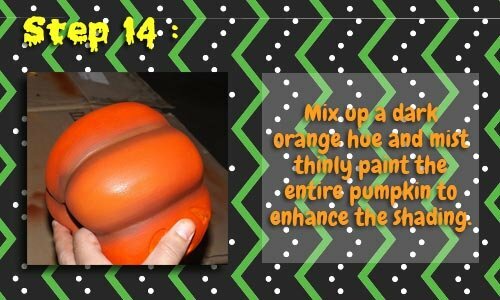 Now mix a dark orange and mist/thinly paint the entire pumpkin to help with the shading or toning. 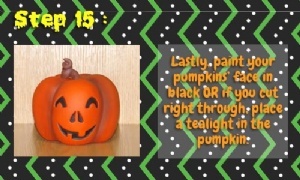 Next you can paint your Jack O Lanterns face on the clay in black if you only carved halfway through. You can varnish the pumpkin especially if it's being used outdoors. If you went all the way ensure the acetone has fully evaporated and put a tea light candle inside and enjoy your Jack O' Lantern!